The Writer/Director of MISSING LINK, Chris Butler, comes to the table with quite an impressive résumé. Nominated for an Oscar and a BAFTA for ParaNorman, his Stop-Motion genius can also be witnessed in Kubo and the Two Strings, Corpse Bride and Coraline. During our sit-down with him, we said how much we enjoyed the humour and Slapstick on-screen with MISSING LINK, he looked genuinely pleased and told us, “I’m glad you think so as that was the hope. I was influenced by that brand of humour. I was influenced by old silent movies and watched a lot of Harold Lloyd, Charlie Chaplin. Initially when I was talking to the studios about this Movie, I told them my intention was to do David Lean directs Around the World in 80 Days starring Laurel and Hardy. That was the hope, or my ambition.”. I mentioned to Butler that one thing I enjoyed about his Movie was it brought me to mind of my childhood and watching those adventure TV shows with one exciting vignette to the next, but wondered if the sophisticated British-centric jokes and skits would fly above the heads of the much younger viewers and make them restless, to which he replied “Not really, I hoped that the Physical Humour alongside the more cerebral stuff hopefully was a good enough mix. The intention for me was always to have this be a Family Movie. For me, animation should not just be a babysitting device. I don’t want adults to plop down their kids and switch off. I want the family together get something out of this with a big smile on all their faces and give them something they all can talk about afterwards.”. Butler then went on to great length on how important the Voice Actors are to the success of any kind of animated film. All animations start with the voices and that the animators need to hear the performance by the actors before they can start working on their craft and developing the physicality of the characters. The Voice Actor is creating a template of what and how the action should be. “There is something about voice acting that is the purest form of acting.”. Butler also spoke enthusiastically and passionately about the future of Stop-Motion animation and how recent technological advancements and innovations will only enhance future productions and embrace this beautiful art form. The germ of the idea for the Plot of MISSING LINK started 15 years ago and Butler kept notes in a book on how the story could progress. When asked what he has planned for his next project, Butler said “The Movie was literally finished a month ago and right now, with the publicity tour and all, when I close my eyes, all I see is MISSING LINK! I need right now for all that to dissipate.”. One surprising thing I took away from the interview was the misconception that Stop-Motion films were more labour-intensive to create than traditional animated movies. Whereas both require hundreds of people working on the project (there were 450 people working on MISSING LINK), it was harder to find people skilled in the art of Stop-Motion and its search to find people led them to places like Russia and Denmark. MISSING LINK is a sight to behold and a joy to watch with some phenomenal Voice Work from its A-List Cast. 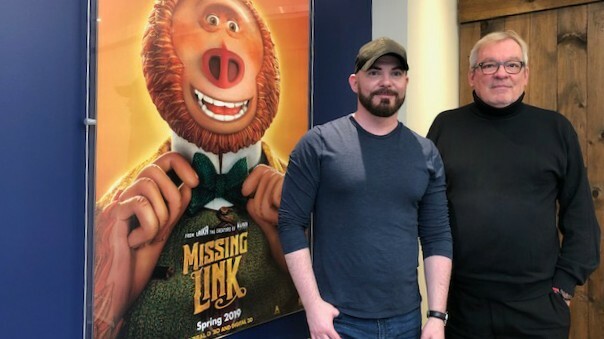 Elevation Pictures release MISSING LINK Friday, April 12, 2019. Our Review of the star-studded Film here.